This year's batch of iPhones aren't the only new pieces of hardware we're expecting to see at Apple's special media event on Tuesday, and an upgraded 4K-capable Apple TV is also strongly rumored to be making an appearance. Thanks to the code embedded in iOS 11, we just learned a bit more about it. The finished version of iOS 11, ready to be pushed out to the public next week, leaked out over the weekend and has been giving Apple analysts plenty of new information about the iPhone X and the iPhone 8, including the final names of the phones. Now developer Steven Stroughton-Smith has found confirmation of a 4K Apple TV device in the code: it's going to have a native resolution of 2160p UHD (4K in other words) and will require a minimum internet speed of 15Mbps if you want to be able to stream all your content at that top-end resolution. It sounds like the new box is also going to support competing HDR formats Dolby Vision and HDR10, which should mean more details in shadows and bright spots no matter what technology your video sources have decided to use. 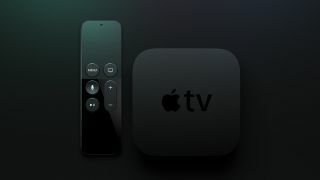 These aren't huge revelations that add much more to what we already knew about the 4K Apple TV, but they help to confirm that such a device is on the way, and at this point it's well overdue - content providers like Netflix are quickly upgrading their films and shows to 4K, and Apple is going to need a box that can handle it. All eyes are now on the special event Apple has got planned for next week, which starts at 10AM PT / 1PM ET / 6PM BST on September 12 or 3AM September 13 AEST (if you don't happen to have an invite, you can watch online for free). Alongside new iPhones and Apple TVs, we're also expecting a new Apple Watch.